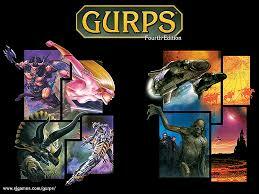 Thursday is GURPSDay, I’m back. Here’s an actual “before 9am” post, and I even wrote something this week, with a more GURPSy shield post that is in my head for today. Sundered Lands 33 (7/13/17) – The companions move past the Training Hall, meet a huge new friend and encounter Bearman zombies! The newest adventures in the Sundered Lands of Palladium, our GURPS: Palladium Fantasy campaign. Grand Duchy 105 (7/13/17) – The Grey Company finds itself embroiled in a battle with a Mummy Lord and its minnions. Things are looking very grim for the heroes. Summary of the latest play session of The Grand Duchy of Adventure, our GURPS: Mystara campaign. Sundered Lands 32 (7/11/17) – The Guardians clear the training hall and prepare to go after Lady Lotus. The newest adventures in the Sundered Lands of Palladium, our GURPS: Palladium Fantasy campaign. Sundered Lands 31 (7/10/17) – The heroes chase the Sea Harpies to the Training Hall and get closer to the Lady Lotus. The newest adventures in the Sundered Lands of Palladium, our GURPS: Palladium Fantasy campaign. Red Sky Volume 6 Planning, Session 2 (7/13/17) – Where I begin start hammering out the plot elements for session 2 of my GURPS: Monster Hunters game set in the Dresden Files universe. This part is mostly just thinking out loud as I effectively storyboard what is to come. Adventure Planning: Casino Escapades (7/12/17) – Time to figure out the fourth scene for the first session of my GURPS: Monster Hunters game set in the Dresden Files universe. This scene involves a completely new PC who is most definitely not a combat guy who is ultimately intended to become the new Apprentice. Adventure Planning: Ghost Library (7/12/17) – Time to figure out the third scene for the first session of my GURPS: Monster Hunters game set in the Dresden Files universe. This scene involves the actual wizard of the group as she (hopefully) handles a ghost issue at OU. Adventure Planning: Penthouse Standoff (7/11/17) – Time to figure out the second scene for the first session of my GURPS: Monster Hunters game set in the Dresden Files universe. This scene involves two OSBI agents (one of which is a brand new PC and newish player) as they get sucked into a hostage situation.